Easy No Bake Lemon Cheesecake Bars with graham cracker crust and lemon curd topping is light and refreshing spring or summer dessert recipe, and perfect addition to Easter table. No Bake Lemon Cheesecake Bars are delicious, light and lemony dessert, perfect for warmer weather. This easy recipe is completely no bake and requires only 20 minutes of active time from start to finish. But you must make it in advance since it needs to sit at least a few hours or preferably overnight in the fridge to set completely before serving. Depending on the occasion for which you’re making this dessert, you can easily double the recipe or make it as a classic, round cake. You can make it in a large pan if you need to feed the crowd. These No Bake Lemon Cheesecake Bars are perfect for picnic, potlucks or family gathering like Easter dinner or brunch. Also, you can use a springform pan instead a square pan and make lemon cheesecake instead of bars. Especially if you want to serve a slice of cake for a special occasion, like Easter. 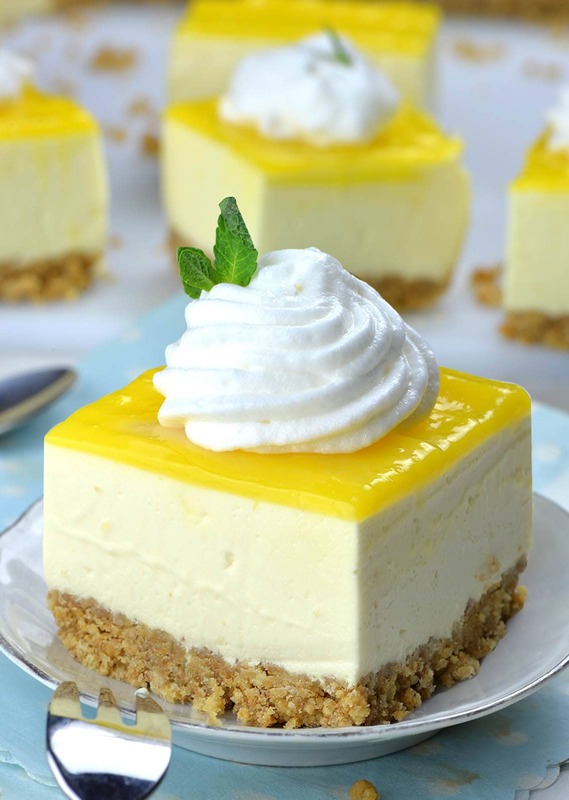 No Bake Lemon Cheesecake filling is light, creamy and smooth. It bursts with lemon flavor so it’s very refreshing and perfect for warmer weather. 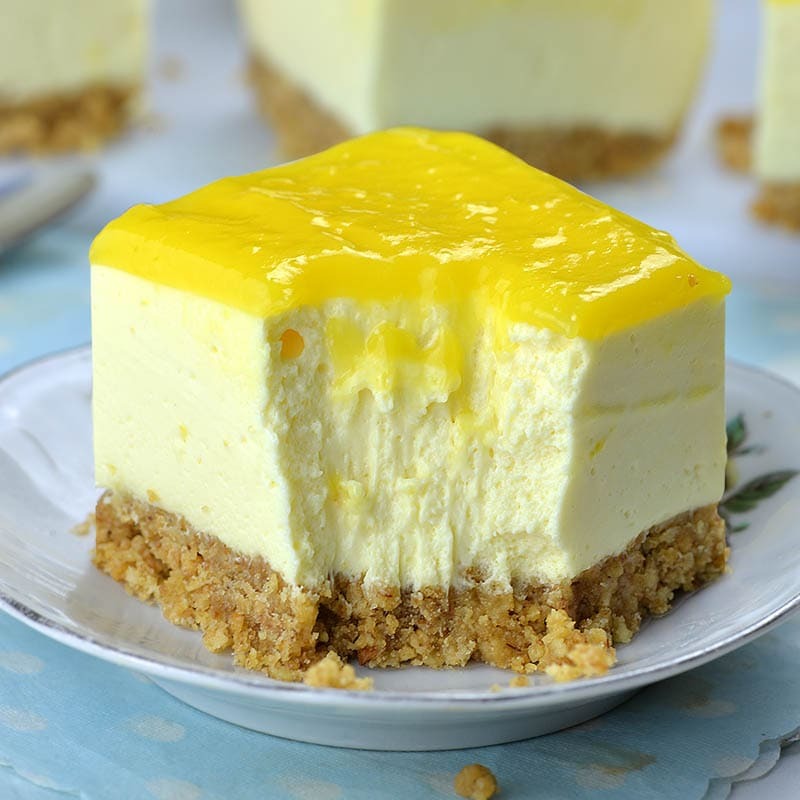 No bake cheesecake needs only few simple ingredients: cream cheese, sugar, sweetened condensed milk, fresh lemon juice and zest and lemon Jell-o or other lemon-flavored gelatin. To make the No Bake Graham Cracker Crust, crush graham crackers in a food processor. Then, stir in melted butter until it’s evenly moistened and press the mixture in the pan. If you don’t have a food processor, you can place graham crackers in a zip-lock bag and crush them with a rolling pin to make the crumbs. Homemade Lemon curd recipe is simple and easy. It takes only 5 simple ingredients and 5 minutes to make. You’ll need: butter, sugar, eggs, freshly squeezed lemon juice and lemon zest. To make the lemon curd, in a sauce pan melt the butter and remove from the heat. Then stir in sugar, lemon juice and lemon zest. Finally, whisk in eggs and cook over medium heat for 5 minutes, or until it starts thickening and coats the back of a spoon. Craving for more lemon dessert!? 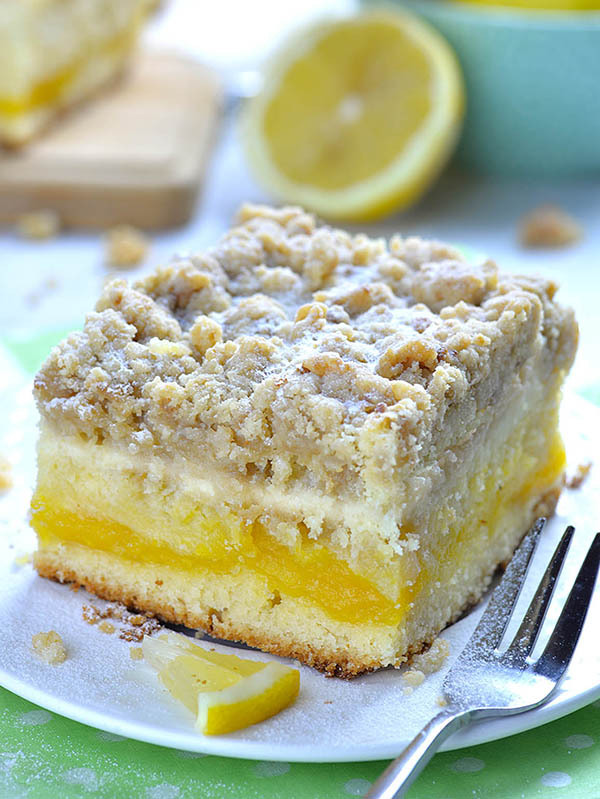 Lemon Coffee Cake is delicious, moist, sweet and tangy breakfast or snack cake, but also very satisfying dessert. Line 9 x 9 x 2 inches pan with aluminum foil or plastic wrap leaving an overhang the sides for easy removal. Lightly grease with cooking spray and set aside. To make the graham cracker crust stir graham cracker crumbs and melted butter until evenly moistened, then press the mixture firmly in the bottom of the pan and place in the fridge to firm. Pour boiling water over lemon Jell-o and stir for about 2 minutes, or until It’s completely dissolved. Add iced water and stir well, then set aside to cool while making the filling. Beat softened cream cheese and sugar until smooth and creamy. Gradually add sweetened condensed milk and mix well. Then, slowly pour in lemon juice and mix until smooth. Next, pour in dissolved gelatin and mix until combined. Finally, whisk in whipped cream and spread the filling over crust. Smooth the top and gently tap the pan onto work surface to settle well. Place in the fridge for a few hours (preferably overnight) to firm completely. In a small sauce pan place the butter and melt over medium heat. Remove from the heat and whisk in sugar, lemon zest and lemon juice. Add eggs and whisk well. Cook over medium heat stirring constantly until it thickens and coats the back of a spoon (about 5 minutes). Transfer in a bowl and cover with plastic wrap to prevent forming the film on top. Cool to room temperature. When the cheesecake is completely set, pull the overhang of the foil to lift the cake from the pan and transfer onto cutting board. Spread lemon curd on top. 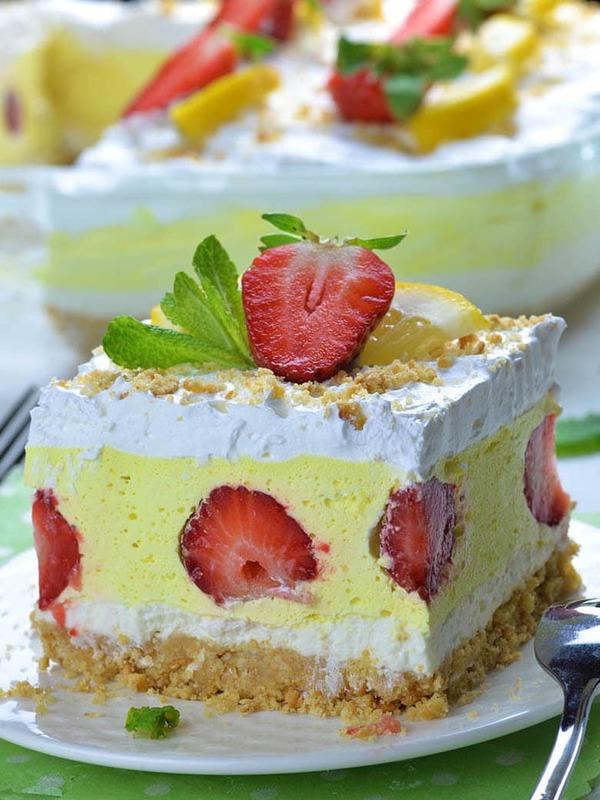 Slice and serve with whipped cream o top. Garnish with mint leaves if desired. Store leftovers in an air-tight container in the fridge. Hello. This lemon dessert sounds delicious. I am using a mo Ike device so perhaps that is what’s causing the issue I’m having but I can not find the actual recipe any place. Am I missing a link or do I need to use a regular computer? Thanks for your help. Where is the actual recipe and instructions? Hi, it is absolutely not clear whether I should take 1 ½ cup of whipped cream that has already been whipped or 1,5 cup of the cream before I whip it… The first is very non-typical to write. Thank you for specifying this matter. Hi Kateryna, it’s 1 and 1/2 cups of whipped cream that’s already whipped. In this recipe can I use cool whip or whip my own? You can do what ever you prefer!